The Honeywell Dolphin 9700hc has been discontinued. No direct replacement is available. 9700/802.11a/b/g/Bluetooth/SF Imager Green Aimer /Numeric/256MB x 1G/Windows Mobile 6.5 Classic/QVGA/English/Health care. Mobile computing has become common place in the Healthcare industry and as a result, units like the Dolphin 9700hc have been designed specifically for these environments. The main difference between this model and other devices is its special housing that can handle the constant cleaning as required in hospitals and clinics. The standard plastic housing found on competing mobile computers would not hold-up over time and fall apart. The size of the Dolphin 9700hc is also a big advantage since it small enough to fit in a nurse’s pocket but still has an easy to read, large screen. 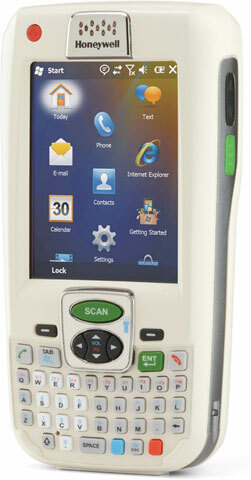 All units also come standard with a 2D imager so you can read any barcode from the patient chart to pharmaceuticals. For anyone that needs access to data on the fly in any Healthcare application, the Dolphin 9700hc was designed for them.